How did this happen? 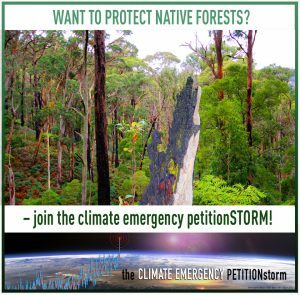 The majority of Australians were fed up with the slow pace of climate action and were demanding real protection for all people, species, and ecosystems. The major political parties realised they would need to work together to tackle such a huge existential threat effectively. The government of the day appointed a new national unity Climate Cabinet, comprised of members of all major parties, with a view to declaring a Climate Emergency and committing to an all-out climate mobilisation effort aimed at giving us all a safe future. In practice, much of the required research had been undertaken over the preceding decade, and political parties had already been planning details of the anticipated mobilisation prior to the formation of the Climate Cabinet. This meant that the government was able to spring into action promptly, thus giving them time to demonstrate the success of the climate mobilisation measures before the next election. 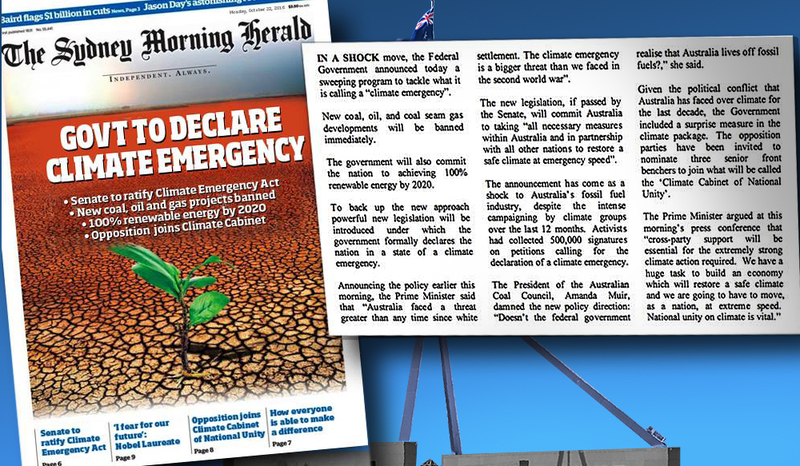 Almost immediately the government began an extensive information campaign to explain to the public the need for abandoning business as usual ‘for the duration’ of the emergency, that is, until the economic restructuring was heading in the right direction to achieve the safe climate restoration goals. This campaign encouraged everyone to play a part. It advertised schemes to incentivise emissions elimination measures, reported on actions individuals and communities were taking, and fostered a culture of ‘everyone is doing their bit’ for the sake of a shared benefit. • high energy efficiency standards for new buildings and appliances. New schemes incentivised reforestation, electric vehicles, energy-efficient building retrofits, retirement/buyback of energy-guzzling appliances and vehicles, zero-carbon steel and cement, a shift to low-carbon animal agriculture, and development and roll-out of measures to draw down atmospheric carbon. A rapid but well-planned and orderly roll-out of renewable electricity generation and a corresponding staged closure of existing fossil-fuel generators commenced, with just transition programs offered to affected workers. A phase out of fossil fuel exports also began, along with development of renewable energy and clean-tech exports to replace the export income. A huge amount of the groundwork was carried out prior to the formation of the Climate Cabinet, and in fact this was necessary in order to ensure a smooth and successful roll-out of the emergency mobilisation policies. The above is one vision – what we think we need sometime very soon. See below for the groundwork already underway and what is needed next for this vision to become reality. Despite decades of climate warnings from scientists, and climate impacts that are already killing people and ecosystems at a little over 1°C warming, too many of us seem strangely resigned to governments not acting to protect us. We tend to think ‘business as usual’ is more powerful than governments, and that politicians who go ‘too far’ with climate initiatives won’t be re-elected. But our lives are at stake. Who really wants to sit back and watch in resigned horror as humanity heads over a cliff? The campaign is a call to action with a focus on how to achieve effective protection for all people, species and ecosystems. 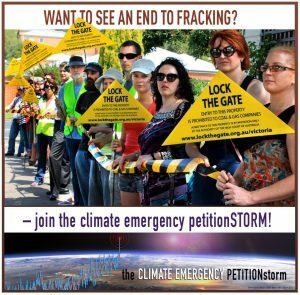 Rather than just saying we are in an emergency, it paints a picture of what governments and the people can do to achieve a safe future, and how the public can and does collectively rise to the occasion when in emergency mode. We already know most of what we need to do to restore a safe climate. We have the technology and even the money to do it. We just need to make the call for a climate emergency declaration and mobilisation into ‘a thing’ – a familiar possibility that the public can imagine and demand. At its core is a mind shift towards recognising that current government policies are needlessly and knowingly putting us all in peril, and that we deserve better. 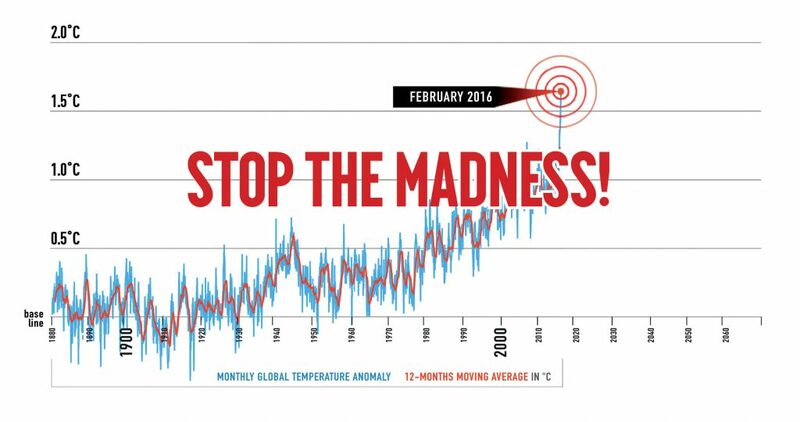 It is perfectly reasonable for us to demand full-scale effective action since nothing less will achieve a safe future. There is a long way to go before the required mind shift spreads to a majority of the population, but already the emergency declaration and climate mobilisation concept is starting to become ‘a thing’. 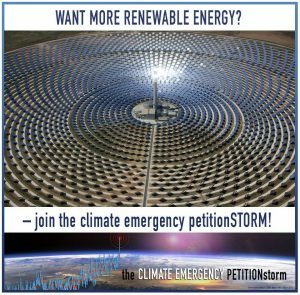 In the first year of the campaign over 18,000 people from all walks of life signed emergency declaration petitions, and use of the expression ‘climate emergency’ has become more common. A number of federal, state, and local government elected representatives and a pleasing number of other eminent people signed statements of support. Around 50 grassroots groups, several state peak environment bodies, and the Sustainable Engineers Society joined in the campaign. A shift from single-issue campaigning began with the realisation that successfully stopping one ‘bad’ project would not stop an endless stream of similar proposals elsewhere. 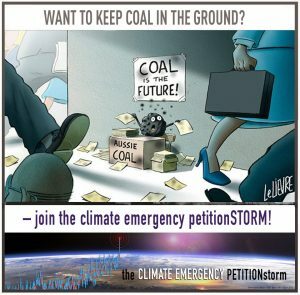 A successful campaign for comprehensive climate mobilisation measures would include stopping all new climate-damaging projects and would automatically achieve a win for all the current campaigns aimed at stopping specific coal, oil, and gas projects. 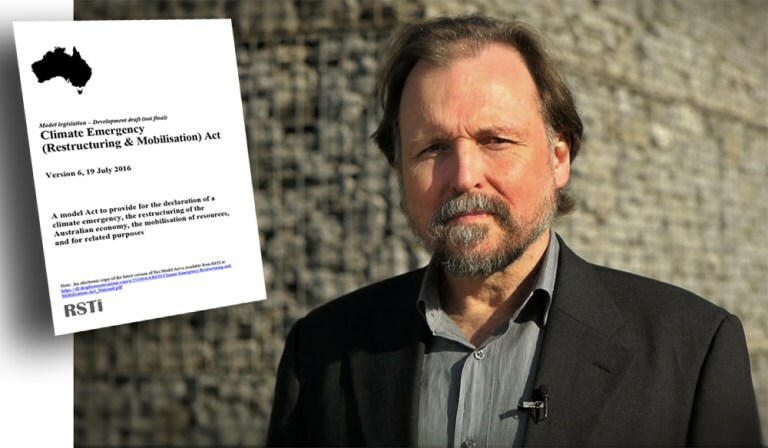 A number of MPs have signed statements of support, and we are encouraging members of political parties to begin branch-level resolutions in support of a Climate Emergency declaration and mobilisation position. The Darebin Council has indicated its support for a Climate Emergency approach. The council hopes to play a leading role in a campaign to get other local councils and also the state, territory, and national governments to commit to Climate Emergency action. Support from other levels of government will give local councils the financial, regulatory, and infrastructure support they need to fully and rapidly deliver Climate Emergency programs at the local level, but in the meantime local councils will be able to begin taking their own climate mobilisation measures. State and territory governments have primary control over the types of projects approved within their own jurisdiction. As a first step in climate emergency action, they could relatively easily ban new climate-damaging projects (coal, oil, gas, etc). The No New Bad Investments (NMBI) model legislation drafted by EJA would enable immediate bans in cases where climate-safe alternatives are already available, and would set strategies and timelines for the transformation of all other climate-damaging economic streams. So far NMBI campaigns have been launched in SA, Queensland, Victoria, NSW, and Tasmania and there is an offshore NMBI petition calling for a ban on new oil and gas projects in Commonwealth waters. The aim is for one or more states/territories to achieve some major climate mobilisation wins early on to show what is possible. The various NMBI petitions, talking points, and action kits can be found here. What is needed next to make a national Climate Emergency Declaration a reality? • At least some states/territories adopting either full-scale emergency declaration and climate mobilisation legislation or No More Bad Investments legislation.